Palaeo-Indian skull on left, a Native American skull on right. 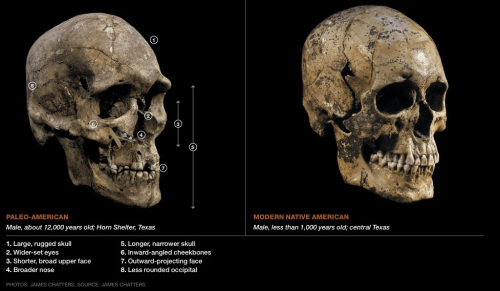 Both are from Texas but some 11,000 years apart in time. Palaeo-Indians (fl. 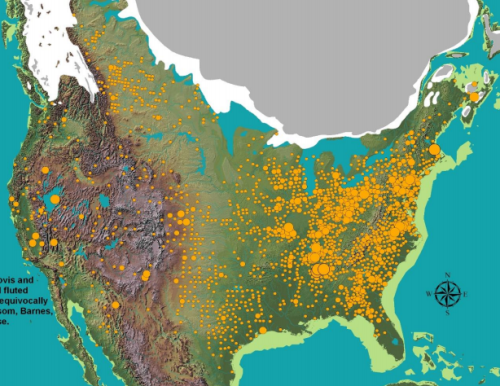 -13,000 to -10,000), also called Paleo-Americans, discovered America. According to Western science they were in Oregon by -12,350 and Chile by -12,250. That was well before Columbus arrived in the Bahamas in +1492. Follow the mammoths: Before 1997 scientists believed that people first arrived in America in the -11,000s when an all-land, ice-free corridor opened up between Siberia and the heart of North America. It was towards the end of the last ice age, a time when sea levels were still low enough that the shallow Bering Sea was Beringia, a land bridge between Alaska and Siberia, and when Canada was no longer a solid sheet of ice. Presumably big-game hunters in Siberia followed the mammoths into North America.